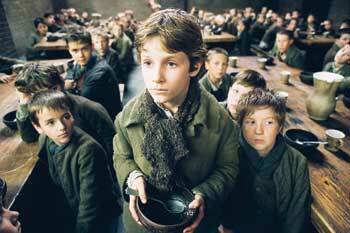 ROMAN POLANSKI has made a perfectly agreeable and entertaining new film adaptation of Oliver Twist, full of beautiful art and costume design and a few breathtaking vistas. It would be a proud feather in the cap of any aspiring filmmaker. But there is far more at stake here. Polanski is no aspiring filmmaker. Having recently won an Oscar for The Pianist and having crafted many masterworks over half a century, he has quite a reputation to live up to. Moreover, Charles Dickens' 1838 novel has been filmed, in various forms, some two dozen times already: silent films, short films, animated cartoons, TV movies, miniseries, sketches, etc. Three of those, Frank Lloyd's Oliver Twist (1922), David Lean's Oliver Twist (1948) and Carol Reed's Oliver! (1968), leave some big shoes to fill. On that level, the new Oliver Twist disappoints on several counts. The story, with its poor eponymous orphan going through interminable psychological torments on the streets of a muddy, corrupt London, seems to be perfect fodder for Polanski, who specializes in lone heroes and their inner demons. Picture an Oliver Twist a little like Polanski's Repulsion or The Tenant—or even The Pianist—and we might have something. But the film errs on the gentle side; even Lean's version is scarier. Polanski and screenwriter Ronald Harwood (The Pianist) have begun by taking out all references to Oliver's heritage, which automatically deletes a certain amount of suspense. Additionally, Polanski's Oliver (Barney Clark) is terribly passive and muted, and it's difficult to crawl into his tattered shoes. John Howard Davies in the 1948 version had the proper haunted eyes and pouty lips, but the best Twist has to be Jackie Coogan in the underrated 1922 silent version. Coogan, who had just appeared in Chaplin's The Kid, had an awesome screen presence and an innate talent for pathos. Perhaps Polanski's worst stumble, however, is the film's pace. At 135 minutes, it tends to lag during the final quarter, when the Bill Sykes character (played here by Jamie Foreman) becomes the focus. Sykes is evil, no question, but Polanski can't find the character's center and paints him simply as a one-dimensional, moustache-twisting baddie. One thing Polanski does best is the portrayal of the Artful Dodger (Harry Eden). His skillful bits of pick-pocketing come across like fluid acrobatics, and it's a delight to watch. In essence, each version of the film has something it does better than all the other versions, and each can be enjoyed as such. If you're looking for an "ultimate" version, there's always the book. Oliver Twist (PG-13; 135 min. ), directed by Roman Polanski, written by Ronald Harwood, based on the novel by Charles Dickens, photographed by Pawel Edelman and starring Ben Kingsley and Barney Clark, plays at selected theaters.